This is a three-story medical arts building, in a residential section of South Miami, with free off-street parking. Located just south of Sunset Drive (SW 72 St.), on west side of Red Road. Coming from the north via 826/The Palmetto Expressway: Take 826 South to Sunset Dr. Exit (SW 72nd St.). Take a LEFT / EAST. You‘ll cross US 1, keep going on Sunset Dr. At RED ROAD (SW 57th Ave.) take a RIGHT (this is a large intersection with a light). You‘ll go a few long blocks. After 78th St., you‘ll see the three-story brown office building on your RIGHT. (It has a large sign with "7800" in front of building.) Park in front or back. Take elevator to 2nd floor. Turn left out of the elevator and go down hallway. About 3/4 of way down on the right, you‘ll see Suite 211. Coming from the north via I-95/US 1 South: Take I-95 South all the way until it becomes US 1 South. Take US 1 South through the Grove and Gables (about a 15 minute ride). At Red Road (SW 57th Ave.) take a LEFT. After 78th St., you‘ll see the three-story brown office building on your RIGHT. (It has a large sign with "7800" in front of building.) Park in front or back. Take elevator to 2nd floor. Turn left out of the elevator and go down hallway. About 3/4 of way down on the right, you‘ll see Suite 211. Coming from south via US 1 from South Dade: Take US 1 to 80th St. Take a RIGHT / Go East on 80th St. (You‘ll see a CVS on the northeast corner). 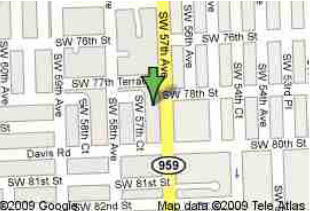 Keep going on 80th St., you‘ll cross Tevis, Ludlum (SW 67th Ave.). At Red Road (SW 57th Ave.), take a LEFT. It‘s a three-story brown office building with large sign with "7800" that will come up quickly on your left. Park in front or back. Take elevator to 2nd floor. Turn left out of the elevator and go down hallway. About 3/4 of way down on the right, you‘ll see Suite 211.